Just got the above message popped up on my 03 E500. Checked the brake reservoir, it's full & clean. Car also drive & brake fine. I'm wondering if the sensor on the brake reservoir's cap is bad. Does anyone know if this is the brake fluid level sensor & what's the part # of it? Thanks in advance. Could be warning to replace brake fluid MB requires SBC fluid change every 2 years. If you feel fluid is fine try resetting. Sensor is located top of reservoir, apparently not available separately EPC only shows container part # 2114300402 (shop used). Konigstiger- Thank you so much. The brake fluid in the reservoir is full & clean so I'll see if I can reset & clear the message. Btw, if I decide to bleed & flush the fluid on all 4 corners, would the procedure be the same as other cars? Just wanted to make sure since ours are equipped w/ SBC. Thanks again. I have an iCarSoft MB so I can disable the SBC if I want to flush the brake fluid, however being SBC, if I use the conventional bleeding method, I wouldn't be able to get 100% of the old fluid out so this morning, I dropped the car off at my MB indy shop. They flushed the brake using STAR but told me it wasn't the fluid as it was clean & the message still there. The owner thinks the EIS (Electronic Ignition System) module behind the dashboard where the key is inserted into may be bad. He said the EIS communicates w/ the ECU & all the SAMs so if it's faulty, it may display the wrong message. He told me it doesn't affect the drivability but bring it back so he can have his guys do some more troubleshooting. What do you think? Last edited by superfast; 01-16-2019 at 02:37 PM. Oh I've just remembered my son told me the other day the car didn't respond to the key fob. He had to pull the metal key from the key fob & inserted into the door in order to unlock the door & started the car. It has been working after that. I'm wondering if the EIS is on its way out. Last edited by superfast; 01-16-2019 at 10:12 PM. I was able to clear the message using the instruction Konigstiger provided, however after driving for 1/2 hr or so, the message popped up again. I've been thinking about the EIS & I'm not convince it's faulty as everything (except for the message) is working & I have no problem using the key fob to start the car. Does anyone knows which module control/monitor the brake? Does the SBC brake has its own module like the ESP & ABC? I dropped the car off at my MB indy shop. They flushed the brake using STAR but told me it wasn't the fluid as it was clean & the message still there. Did they do a quick test checking for codes? Have local MB dealer check SBC under extended warranty. If no fault codes come up they should not charge you and may offer an at cost solution. Depending on cost you have the choice to walk away. The owner of the MB indy shop told me his tech couldn't delete the message but there's no code. I'm wondering if I may have cleared it w/ the iCarsoft the day before. In regards to the SBC, it had been replaced w/ a new OEM by a local MB dealer about 7 years ago. Anyway, I'll drive it for a few days then check it again w/ either my iCarsoft or take it back to the indy shop for additional troubleshooting. Thanks. I've been driving for a few days now & the issue appears to be intermittent as the message sometime would go off for a day then came back on after the next start. SBC has been checked out w/ no faulty code & car is braking fine which make me think either the brake pressure sensor on top of the brake fluid reservoir or 1 of the SAMs (Signal Acquisition Modules) is faulty as its job is to receive & monitor signals from various sensors & communicate w/ the ECU. Does anyone know the locations of these SAMs? I believe there are 3 of them (left, right & rear). Does anyone also know if the sensor on top of the brake fluid reservoir can be removed & how to test it? Thanks. After some troubleshooting, I found out the cause of the message is due to an intermittent on the brake fluid level sensor's connector. Everything is working fine now. Btw, I measured the resistance of the sensor. It's 0 & 330 Ohms when the reservoir is empty & full, respectively. 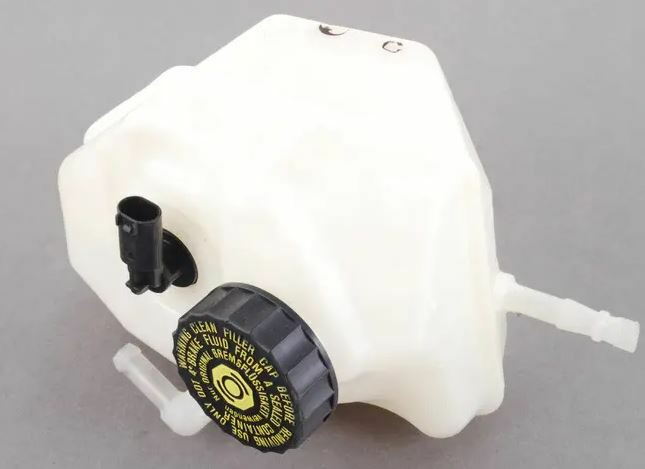 Since the sensor is integrated into the reservoir & its function is to monitor the brake fluid level only so for some of you, if your sensor is faulty & don't want to replace the whole thing due to cost (over $200), you can bypass the sensor by putting a 330 Ohms across the connector. Last edited by superfast; 02-05-2019 at 06:16 PM.